A United Nations expert has issued an urgent appeal to lower political and military tensions on the Korean Peninsula over continued missile tests by the authorities in Pyongyang following on a similar call earlier in April by world and Korean church leaders. "The recent rise in conflict rhetoric is worsening already critical human rights challenges in North Korea," said the Special Rapporteur on the situation of human rights in the Democratic Peoples' Republic of Korea, Tomás Ojea Quintana. "At a time when the international community needs to come together to protect the rights of people in the DPRK [North Korea], we are instead witnessing a rise in incitement to armed confrontation," he said. "Statements that feed hatred and polarization do nothing but undermine opportunities to improve the dire situation of ordinary North Koreans," the human rights expert stressed. The World Council of Churches had on April 14 joined the National Council of Churches in [South] Korea in expressing grave concern at the re-deployment of the USS Carl Vinson aircraft carrier group to the seas surrounding the Korean peninsula. The issued their statement the context of "already heightened tensions - especially in the midst of the ongoing joint US and South Korean Foal Eagle-Key Resolve military exercises." They noted that the movement of the U.S. ships had been taken during the deployment of the U.S. THAAD missile defense system in South Korea, and North Korean threats of a nuclear response. "This constitutes a further escalation of military confrontation in the region," said the church leaders. The WCC said it had been engaged for more than 30 years in promoting dialogue between North and South Korean Christians, accompanied and supported by representatives of the "global fellowship of churches in WCC membership." "Our purpose has been and continues to be the promotion of peace and reunification of a country and people divided by an unresolved conflict. "Particularly in recent years almost all other channels of dialogue and encounter have been closed off, in favor of escalating military confrontation and tightening sanctions. "We do not believe that this is a recipe for peace, but rather for increasing the risk of conflict. War cannot achieve a sustainable peace, as the modern history of the Korean peninsula all too tragically demonstrates." The National Council of Churches in [South] Korea said, "We implore the United States government to solve the North Korean nuclear issue through mutual talks of peace from both governments. The conversation must happen now." The U.N. Special Rapporteur's appeal which was aimed at both the North and the South followed the series of declarations and military actions which he said have fueled tensions in the region. These include North Korea's program of nuclear and ballistic missile tests, and the deployment of the U.S. States aircraft carrier group to the area. "The onus is on all of us to lower tensions and restore dialogue, including on human rights. But U.N. member States, in particular the DPRK and other governments involved in current hostilities, have to realize the great responsibility on their shoulders to preserve peace and stability, in accordance with the U.N. Charter," Quintana noted. 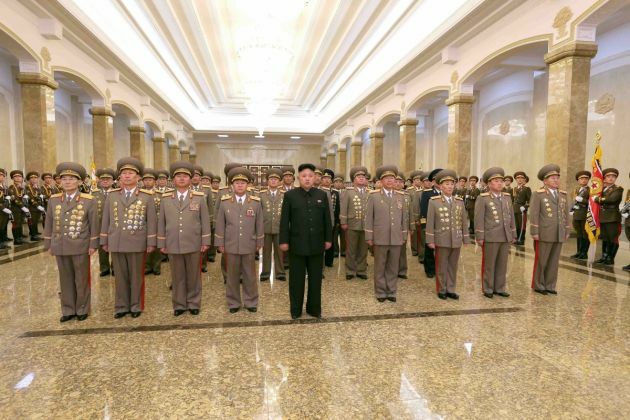 North Korea is subject to international and unilateral sanctions to curb its nuclear program. Despite this, theNort country has reportedly conducted five nuclear tests since 2006 and continues to carry out long-range missile launches on a regular basis many of them over waters bordering its neighboring south and Japan.